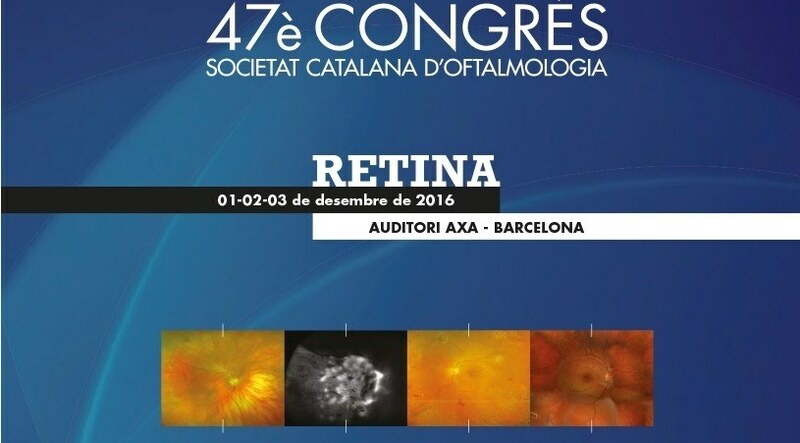 On December 1st, 2nd and 3rd will take place in Barcelona the 47th annual Congress of the Catalan Society of Ophthalmology, in which many ICR ophthalmologists will take part. This year, the congress will be especially focusing on retinal diseases, around which three very dynamic round tables will be organised on medical retina, surgical retina and clinical cases. Oral communications and videos will also have an outstanding place within the congress. At the end of it, the Catalan Society of Ophthalmology scholarships will be awarded, as well as the prizes to the best oral communication, poster and video. Symposia will be held during the first evening of the congress and will address several eye diseases. Dr. Alfonso Antón, Head of ICR Glaucoma Department, will take part in the symposium “Contribution of SS-OFT to glaucoma”, with “Applications of OCT Swept Source in posterior and anterior segment in the assessment of glaucoma”. Also, Dr. Ignasi Jürgens, Medical Director and Head of Retina and Vitreous Department at Institut Català de Retina will take part in the symposium “Vitreoretinal surgery from another point of view”. Video sessions during the congress will begin with Pericraneal graft for fornix reconstruction in anophthalmic cavity, presented by Dr. Pilar Cifuentes, from ICR Orbit and Oculoplastics department, that will illustrate the case of a patient with an anophthalmic cavity with lower fornix shortening that prevented the correct positioning of eye prosthesis and the use of pericraneal graft in such case. Later on, Dr. Clara Berrozpe, from Neuro-Ophthalmology and Strabismus Department will present Unilateral accommodative spasm, that will address a case of this infrequent type of accommodative spasm. Finally, Dr. Amanda Rey, from ICR Department of Retina will present Intraoperative Optical Coherence Tomography in vitreoretinal surgery, whose aim is to assess the usefulness of this technique (iOCT) in vitreoretinal surgery. The first oral communication session will include Dr. Maria Vidal communication under the name Efficiency and safety of deep sclerectomy in the long run, that aims at assessing the efficiency of this technique in the three years following an isolated (phakic or pseudophakic) or combined surgery with phacoemulsification. In the 2nd session of oral communications, Dr. Víctor Menezo, from ICR Retina and Vitreous and Uveitis Departments will present Multimodal image techniques in the diagnosis of Acute Zonal Occult Outer Retinopathy (AZOOR), aiming to prove the diagnostic use of several image techniques for the early diagnosis of this disease. Congress round tables will be dedicated this year to retinal diseases. The first round table will address medical retina and will deal with new diagnostic methods, such as angio-OCT and its applications for vascular retinal diseases, as well as new treatments for the most common retinal diseases, such as age-related macular degeneration or diabetic retinopathy. In the second round table on surgical retina new techniques will be addressed for complex eye injury cases and vitreoretinal diseases in children, as well as the use of small surgical tools. During this round table, Dr. Ignasi Jürgens will present Computer-assisted ophthalmic surgery: welcome to the future. Finally, a round table discussing clinical cases of diseases affecting the retina will be held. It will have an interactive system in order for congress participants to contribute to diagnosis. Dr. Xavier Maseras, ophthalmologist at ICR Retina and Vitreous Department will take place in this round table. During the three days of congress, 9 poster presentation sessions will be held, starting with a first session chaired by Dr. Lorena Castillo, Head of ICR Neuro-ophthalmology Department. The first one will be presented by Dr. Berrozpe, under the name Atypical optic neuritis by Epstein Barr Virus (EBV), and it will analyse two clinical cases of EBV optic papillitis cases. The second one will be presented by Dr. Cecilia Gómez, from Neuro-Ophthalmology Department. Under the name When low visual acuity in a child is not due to a refraction error, it analyses a case of dominant optic atrophy (ADOA), a hereditary optic neuropathy consisting in a bilateral and symmetrical papillary paleness with a decrease in visual acuity that usually appears in early life stages. The third poster, also by Dr. Gómez, will deal with the Importance of clinical suspicion in neuro-ophthalmological diagnosis, in the case of a patient suffering from a carotid-cavernous fistula. During the third poster session, Dr. Agnieszka Dyrda from Retina and Vitreous Department, will present Occult macular dystrophy: clinical, functional and morphological findings, a retrospective review that aims at describing the above-mentioned findings in this infrequent and difficult to manage disease. Moreover, during the same session, Dr. María Soledad Pighin, from the same department will present Management of vitreous haemorrhages in a healthy patient, aiming to determine complications associated to vitreous haemorrhage caused by posterior vitreous detachment. Finally, during the eighth poster session, Dr. Kattia Sotelo, from ICR Glaucoma Department, will present Vascular occlusion in a glaucoma patient.